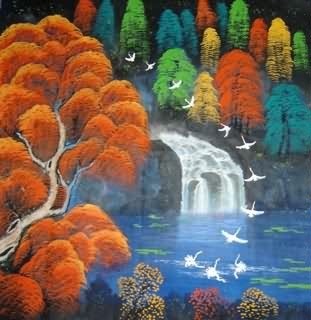 The most popular subject of Chinese trees painting includes Chinese banyan tree, pine tree and cypress painting. Other trees such as Chinese parasol tree(Firmiana simplex), white birch, willow(sallow, osier) and coconut palm are also very common themes of the Chinese paintings. Chinese Banyan (Ficus microcarpa) Tree Fengshui Painting : (榕树) The banyan tree is as a symbol of decency, steady, tenaciousness, up-and-coming character. The banyan tree is always with luxuriant foliage, so it symbolizes that the riches and honour will last for a long long time, and it is regarded as a symbol of auspiciousness, longevity, splendour, wealth and high position. Chinese Pine Tree Feng Shui Painting : (松树) The pine tree is a long-lived evergreen tree and has special shape which is well worth appreciating. Many places of interest in China are well known as the attractive ornamental plantings made by pines. The most famous one of them is Huangshan mountain in Anhui province. In China, the ancient pines are often related to the long history and culture. Chinese people regard pine as a symbol of the noble characters of strength, purity, resilience, and the ability to overcome adversity. Pine, along with the bamboo and plum blossom, they are three good friends resisting cold weather together. Chinese Cypress Tree Fengshui Painting : (柏树) Along with the pine, the cypress is also a long-lived evergreen tree. The Chinese character for cypress is pronounced "bai" which is exactly like the character "百(hundred)", it also means every and numerous. So cypress is often used together with other things as a theme of art, such as: 1. "bai shi ru shi(百事如意)": Cypress twigs, persimmons(in Chinese sounds like the character for matter, thing or affair) and a Ru-yi(an ornamental object usually made of jade. It's a symbol of good luck). This combination sybolizes "May everything go as you wish". 2. "bai shi da ji(百事大吉)": The patterns of cypress twigs and tangerines(in Chinese sounds like the character well). This combination symbolizes "May everything go well with you". In China, cypress has long been regarded as a symbol of longevity, justice, nobility and eternity. Chinese ancient people thought that cypress also had the foundation of avoiding evil spirits. Chinese Parasol Tree (Firmiana simplex) Feng Shui Painting : (梧桐树) As phoenix trees, Chinese parasol tree is regarded as the auspicious and immortal tree. The combination of Chinese parasol tree and magpie is called "tong xi(同喜)", which means "happy together" and symbolizes auspiciousness. Chinese White Birch Trees Feng Shui Painting : (白桦树) White birch is an ornamental tree and often grows to ornamental forest. It's pure white and has a straight trunk. White birch symbolizes pure love and attic faith. 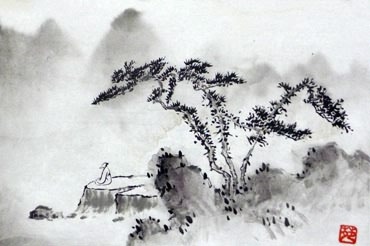 Chinese Willow Tree Feng Shui Painting : (柳树) Chinese people regard willow(sallow, osier) as the a messenger of spring. In Chinese folk culture, willow also has the foundation of warding off evil spirits and bringing good fengshui. In Chinese, willow sounds like the word "留(ask sb to stay)", besides, willow twig is flexible, that implies the everlasting feelings, so willow twig was often given to a friend/family member who is going to be on a long journey. Willow is also a symbol of beauty. Chinese people often use it to depict the slender beauties. InkDance Price: USD 599 /GBP 492 /EUR 570 Sold, you can customize it.